As autumn comes to the Stour Valley, SB tells us what’s happening in her garden on the banks of the River Stour. Many thanks to her for these interesting insights. Autumn mornings can be breathtaking at sunrise when an early morning mist forms over the water meadows opposite us. The mist suspends above the river itself in low, wisp-like, endlessly moving shapes and rolls in dense swirls across the meadows, gently caressing, creating an ethereal curtain across the valley. The dark forms of the cattle can just be seen through the mist. Overhead the geese fly in formation accompanied by their constant calls to each other; a stirring sound of the wild. When the Canada geese return to the water meadows it is a sure sign autumn has arrived. There are Greylag geese amongst them too. Before I write about happenings in the garden I must just tell you of an experience I had when out walking my dog. We were walking up a tramline in a nearby sugar beet field when I spotted a worm on the surface of the soil. Attached to the tail of the worm was a black beetle, which was pulling with all its might, twisting onto its back with the effort at times. The worm did not seem to be particularly distressed and proceeded on its way slowly but surely being stretched out by the beetle tugging in the opposite direction! I watched with morbid fascination as the worm continued to elongate. All of a sudden the small end section of the worm broke off and the beetle scuttled off with its prize! The worm continued on its way seemingly unperturbed. The walnut tree is being raided by land and air! The grey squirrels are busy doing what squirrels do and no doubt we will have walnut seedlings popping up all over the garden as usual! The air raids are by the rooks who fly off with a walnut firmly in their beaks back to the rookery. 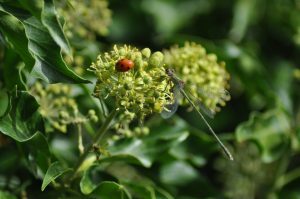 The ivy flowers have been literally abuzz with insects of all sizes including bees, butterflies, ladybirds and hornets. Ivy is such an important food source at this time of year and obviously greatly enjoyed by so many insects. 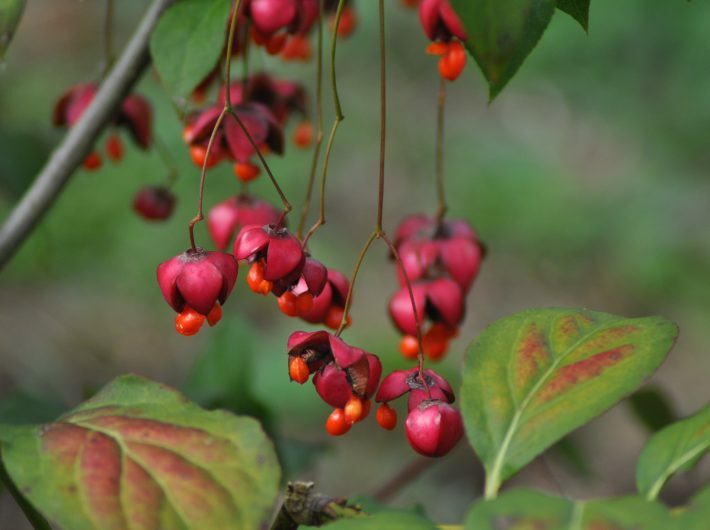 We planted a spindle tree in the spring, Euonymus europaeus ‘red cascade’ (pictured), by the sluice gates and despite its small size it produced several stunning fruits for us and gave us a hint of what is to come when it matures. The cygnets are dispersing, only three now come to the back lawn on a regular basis. A swan was seen forcefully attacking one of the cygnets in the river, I am not sure if it was the parent or an interloper. The cygnets are “encouraged” to leave by the parents in due course, so perhaps this process has begun. In all my years living here I have never witnessed a cygnet flying for the first time. This morning, I did see one “running” up the river, flapping its wings in the manner of a swan launching itself but it sank back down onto the river. A trial run, perhaps!